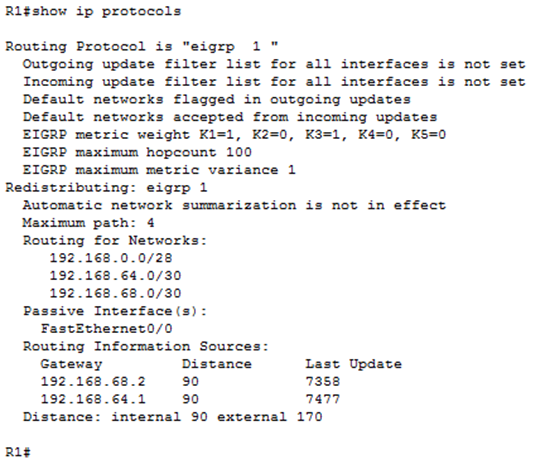 For the first time in about ten years I had to deal with EIGRP last week, so I thought I would run it up in a lab. 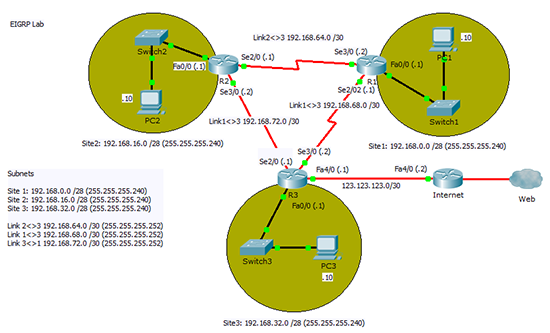 Normally I would use GNS3 but for this procedure I’ll use Cisco Packet Tracer. In fact I’ll include the files so you can download and use the lab yourself, (if you have a copy of Packet Tracer). And I’ll also include the configs for all the routers. In the lab I’ve got three sites connected via serial connections, and one of those sites has the Internet connection. As you can see I’ve used VLSM to split up the 192.168.0.0/24 subnet to create the six networks I need, (three on the sites, and three for the links). 1. I will start at the beginning with Router R1 in site 1. 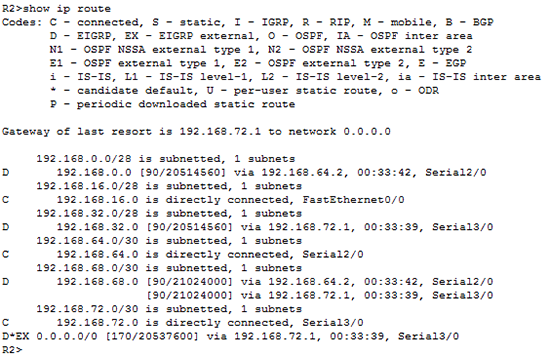 As you can see I’m going to give the FastEthernet 0/0 interface to the inside network (192.168.0.1/28). I will use Serial 3/0 to connect to Site 2 (192.168.64.2/30), and Serial 2/0 to connect to Site 1 (192.168.68.1/30). I will mirror these three settings around the network (going clockwise) and I will configure all the Serial 2/0 interfaces to set the clock speed for the serial links. 2. I will replicate those settings on the Routers R2, an R3 (Note: At this point I will not configure the Internet link, I’ll do that later). 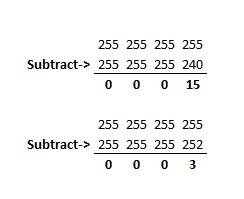 href=”http://www.petenetlive.com/KB/Article/TechTerms#AS”>AS number of 1, then I am adding all the networks that I want this router to advertise (don’t forget to add the subnet that connects each router to its neighbour). When enabled EIGRP will send routing updates onto each of these networks. As you can see from the diagram, this would mean that the router would send routing information onto the LAN. While this wont cause any problems, it does generate traffic that does not need to be on the LAN, so I’ve disabled that by using a passive-interface* command. *Note: If you have a lot of interfaces you want to be passive, you can ‘swap the logic’ by using passive-interface default and then setting all the interfaces you want to advertise networks out of, as no passive-interface. 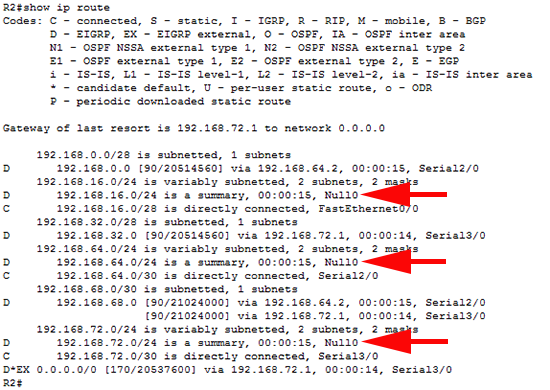 Above you can see it has added three more routes to networks that (at the moment) don’t exist, which is fine, but then you can NOT use those subnets in the future. If you did and this router saw that traffic it would send it to Null0 (i.e. drop the traffic). 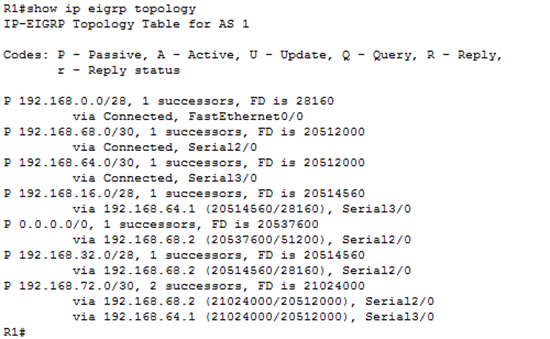 With auto-summary disabled, the routers routing table is a lot cleaner (see below). 5. Repeat the process for routers R2 an R3. 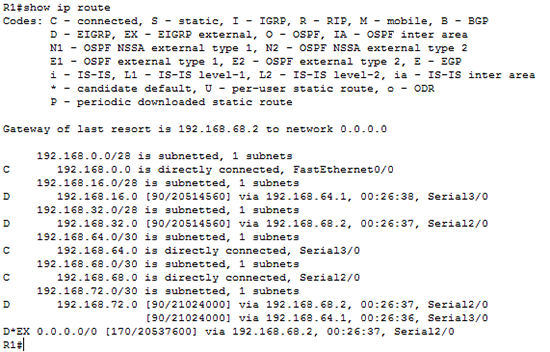 To add in the networks ‘route out’, I need to bring up and configure another interface on router R3 (FastEthernet4/0). Then I will configure that as the default route (GOLR) for that router, and add that new network into the advertised routes. To get all the other routers to use the static route I’ve just configured on this router, I use the redistribute static command (while in config-router mode). Note: In the lab I don’t have a link to the Internet so I’ll simply use the Loopback interface on the Internet router and give that the 4.2.2.2 IP address.